Sharing your journey and spending time with others will leave you feeling more relaxed at your end destination. Whether travelling by car, by bike or by walking, GoShare has lots of benefits. 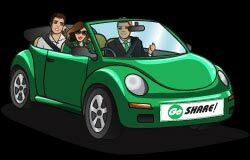 Car sharing is a great way to get to your destination in a sociable, sustainable way. In a rural region like Dumfries and Galloway and can save hundreds of pounds a year. Find out more. There are many ways to get into car sharing, . your GoShare stories and suggestions. What would make you car share more often?